Create a more efficient and compliant formula-based manufacturing supply chain with Selerant’s Supplier Collaboration Portal, a one-stop-shop for vendor communication and supplier relationship management. Today, procurement teams must balance a global supply chain that includes a huge ecosystem of suppliers with regulations that require transparency for each raw material source and manufacturing process that impacts your customers. Supplier relationship management (SRM) tools lift these data provision burdens faced by suppliers and the data collection burdens of manufacturers by standardizing and automating all vendor communication and data collection into one digital system. Companies in the pharmaceutical, cosmetics, food and beverage, and specialty chemicals industries that use SRM tools to take out this busy work produce more accurate and valid supplier data, ultimately driving more agile, competitive and compliant communication and collaboration between suppliers and manufacturers. Standardize supplier processes: Standardized processes, schedules and expectations across supplier relationships. Centralized data use: Easily use and update supplier data across product development documents and processes in real-time. Create more efficient procurement: Efficiently align procurement needs with supplier needs. Control compliance: Quickly identify and respond to supply chain challenges and compliance risks from outside vendors before they impact production. Implement faster times-to-market: Create more profitable partnerships by reducing errors and bringing products to market more quickly at more efficient costs. Offer top-shelf partnerships: Make it easy to do business with your company by offering more competitive and appealing internal processes to potential vendors and partners. Selerant’s Supplier Collaboration Portal (SCP) provides one system to gather, store, share and trace your supplier data and documents and integrates supplier data directly into your product development and supply chain business processes. The SCP enables your suppliers to digitally submit necessary material in a standardized format, shoring up the accuracy and validity of supplier data and improving collaboration among many suppliers and manufacturers with a fraction of the administrative work. With complete transparency and control over your supplier relationship management, procurement teams can put the focus back on running a more traceable, efficient and compliant supply chain. Gather, view and work with enterprise-wide, standardized supplier data in one system. Send standardized forms to multiple vendors and facilities and directly include their data into product specifications. Reduce errors and missing information across supplier profiles. More easily identify and mitigate potential risk factors with individual suppliers and across the whole supply chain. Standardize and streamline supplier communication and expedite vendor onboarding. Bring higher-quality products to market faster in a shorter period of time. The Supplier Collaboration Portal includes sets of pre-built questionnaire templates specifically designed for formula-based industries. Templates are sent to vendors as a web form in the SCP. When submitted, the system digitally processes and pulls the information provided by your suppliers directly into your product ingredient lists and internal specifications. 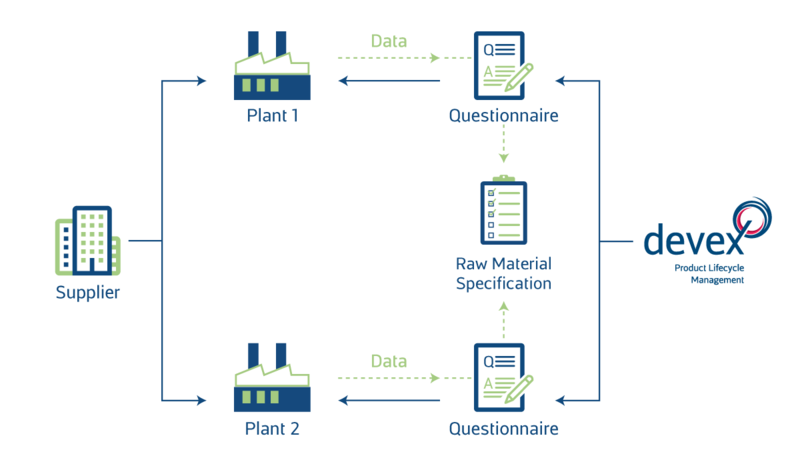 Use standard questionnaires to collect information on supplier’s raw materials, finished goods, facilities and other data points. Collect more accurate and valid supplier information with less effort from the very start of a supplier relationship. Send one questionnaire to many facilities or vendors at one time. Create greater visibility into supplier profiles, manufacturing locations and policies and procedures. The Supplier Collaboration Portal drastically reduces vendor onboarding and approval steps, enabling you to kick-start product innovation faster and create a full-circle history of vendor updates. Collect order certifications, vendor documentation, and regulatory documentation into one supplier profile. Create specific folders for each vendor or supplier and link objects to related documents and projects. Organize projects by facility or material origin, keeping all certifications and orders associated with that supplier in one place. View history of supplier communication and documents in one system. Quickly re-approve vendors for new materials. Really knowing if your supplier relationships and partner operations consistently align with the exact regulatory standards your company must meet can be a gamble. The Supplier Collaboration Portal takes the guesswork out of knowing if your vendors are reporting quality materials and processes by keeping all vendor documents and data in a central, useable format. Review, approve and transfer vendor data at each stage of product development. Use audit logs and version control to track how supplier information and profiles change over time. Automated pre-expiry notifications to track the validity of various supplier certificates and audit statements. Browse a complete, easy-to-search document management library for each vendor. Learn how to improve business processes, produce higher-quality products to market in a shorter amount of time and yield better bottom lines today with the Devex Supplier Collaboration Portal.